Back in December, the Trump FCC repealed net neutrality. Originally agreed to by the Obama FCC in 2015, net neutrality prohibits carriers/ISPs from blocking certain websites, charging more for access to specific websites, or seeking premium rates for higher quality internet service. 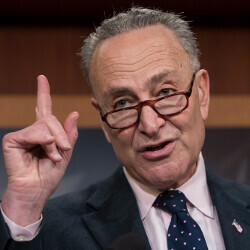 But before you bemoan the end of net neutrality, a last minute war is being wagered in the Senate and Senate minority leader Chuck Schumer (D-NY) now says Democrats in the Senate are a single vote away from restoring net neutrality. A resolution that would restore the Open Internet Order of 2015 now has 50 votes. All 49 Democrats and one Republican (Susan Collins of Maine) are siding in favor of the resolution. But one more vote is required to prevent Vice President Mike Pence from showing up in the Senate to cast the deciding vote. If the Democrats can get one more vote from the other side of the aisle, it would be a slap in the face to FCC Chairman Ajit Pai, appointed to the post by Trump. As if trying to get one more vote isn't enough pressure, the Democrats are hamstrung by the clock. The Congressional Review Act gives the Senate 60-days to challenge a decision made by an independent agency like the FCC. With less than 30-days to go, Schumer and his coalition will have to scramble to reverse the repeal of net neutrality. How exactly did that Republican Susan Collins m side with the Democrats in vote of net neutrality? I hope it isn't fishy (bribery), just saying. More fishy than the bribery that was the reason for the repeal in the first place? Nope, he was made chairman by Trump three days after Trump's inauguration. He was previously a Republican FCC representative, obviously approved by Obama as he was the Pres then, but he's always been a Republican representative. You didn’t exactly counter what he said. He just said Ajit Pai was placed on the FCC by Obama which is a true statement. Obama appointed him to the FCC in 2012 at the recommendation of Mitch McConnell. Regardless of President, FCC membership (and other agencies) is split amongst political parties. His point was pointless. Are you that disgusting racist indian troll, starting a new account every day now, "AxelFoley"? Why don't you just end yourself, so we don't have to see you on here any more? That's not who you think it is. He may have the profile pic, but Axel has been here for a good long while and I've never seen him say anything with racial connotations, let alone prejudice. Well...as long as Apple isn't currently considered a race or ethnicity. Well, if you decide to only read half of what I said, we could argue you're right. But, then we're really not having a conversation, are we? The part where I made it perfectly clear he's a choice made by the GOP is enormously important. He's a republican, corporation lackey, like all other Republicans. The resolution will most likely pass the Senate but face an uphill in the House. Why? Because it all has to deal with who is up for midterm elections in vulnerable “purple” states or districts. Those who feel vulnerable will sign onto the measure while those who are safe will not. It will not not pass because it will likley not get voted on. The handful of purple state Republicans do not outweigh the majority of Republicans who do no not want it. Unless the majority of the majority will vote for it, it won't come to the floor. 51 votes are irrelevant unless Mitch McConnell is one of them. By not allowing the vote, purple state Republicans can go on saying they are for net neutrality but it just never came up. Someone compared the Internet to the highway system. Companies that use it more, pay more road tax. This made sense to me. That someone, Bill Gates, also did a complete 180 on that analogy, as it's dumb. Consumers are paying for the amount of data they use. Net Neutrality is there to protect the consumer from not getting charged twice for the product. If the ISP is allowed to double dip on charges, who do you think gets to pay both ends of the charge in the end? The companies aren't going to have to worry about anything. Whatever happens, the costs will end up at the consumers door. Wow, you are so literate.